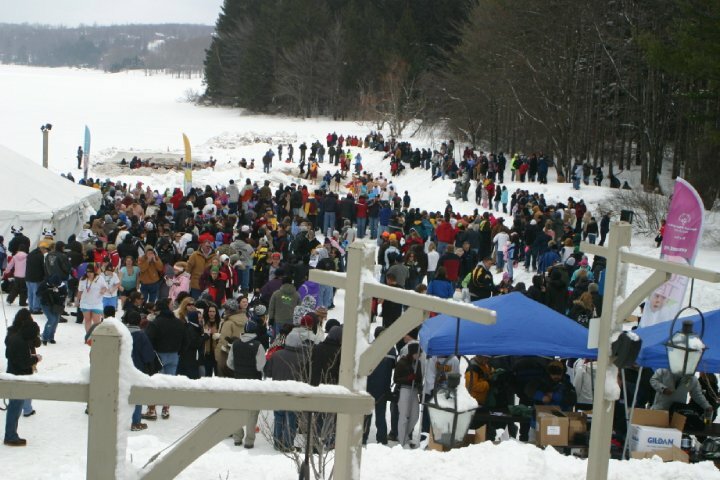 The 18th Annual MSP/NRP Deep Creek Dunk – don’t be left out of the cold! 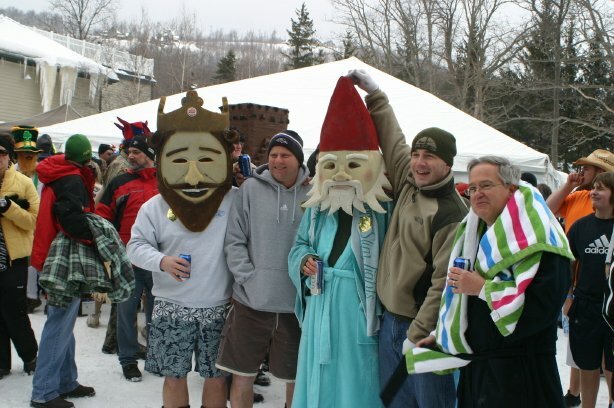 Let the fun begin and be a part of all the chills and thrills of Dunk 2016 on February 20, 2016 in Deep Creek Lake. 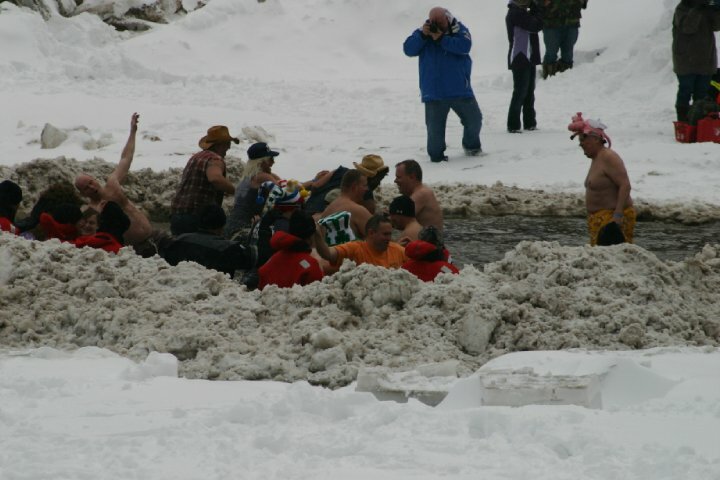 It’s not just an event – it’s an experience that has become a winter-time tradition for thousands of warm-hearted Dunkers! And it all benefits Maryland’s children and adults with intellectual disabilities, as they enjoy the life-changing benefits of participating with Special Olympics Maryland. Plans have been finalized by the Maryland State Police and Natural Resources Police for Saturday’s 12th annual Deep Creek Dunk and Friday night’s DunkFest celebration. The annual charity fundraiser for Special Olympics Maryland is set for Saturday, Feb. 27, and as many as 1,000 dunkers are expected to take part in the event. Participants come from all across the region, making Deep Creek Lake a popular weekend destination for several hundred people from Baltimore and the surrounding areas during the weekend’s festivities. Last year’s 11th annual MSP/NRP Deep Creek Dunk raised $162,000 with the help of just under 800 dunkers, with all proceeds benefiting Special Olympics Maryland and its year-round sports training and competition programs for individuals with intellectual disabilities. A significant portion of the funds raised support the 47 Garrett County athletes who train and compete throughout the year. According to a spokesperson, the Dunk underwrites the entire annual budget for SOMD Garrett County, which includes transportation, uniforms, facilities fees, equipment, and meals. The dunk activities begin on Friday night at the Honi Honi “DunkFest,” and features the Toast Your Buns Bonfire from 6 to 10 p.m.; live music beginning at 8 p.m.; an outdoor pizza party and carnival games for the whole family; and fun drink specials both inside and out. Those who are dunking on Saturday may pre-register anytime between 6 and 9 p.m. Friday evening, and skip the lines altogether on Saturday. In order to join the event and take a dip into Deep Creek Lake, participants must raise a minimum of $50 in pledges. For that contribution they will receive a complimentary meal from Uno Chicago Bar & Grill, a commemorative event sweatshirt, and a group color photo. Special prizes will also be awarded for the top three fundraisers, the top law enforcement fundraiser, the best costume, and the top fundraising team. Heated changing tents are available on the lawn for both men and women to change in before and after. Day-of registration begins at noon on Saturday, and the Dunk will take place at 2 p.m. There is no fee for spectators, and dunkers of all ages are welcome – though participants under the age of 18 will need signed parental consent. To register, persons may visit the web site at www.dunk-md.com or call 800-541-7544, ext. 503 (Md. only), or 410-789-6677, ext. 503, and register through the 24-hour Dunk hotline. Dunk-day activities include music by DJ Jonny Rock, food, a wacky costume contest, and a live remote by WKHJ 104.5. Following the main event, the Black Bear Tavern is hosting the official Post-Dunk Party from 6 p.m. to close, complete with live music. A suggested $5 donation to Special Olympics Maryland gets all the official Deep Creek Dunk oval sticker and the chance to win prizes all evening. The MSP/NRP Deep Creek Dunk, presented by Uno Chicago Bar & Grill and the Garrett County Chamber of Commerce, is coordinated jointly by the Maryland State Police, Natural Resources Police, Maryland Park Service and several other local law enforcement agencies. The MSP/NRP Dunk is just the beginning of a full weekend of activities for Special Olympics Maryland, with the annual SOMD Winter Games beginning the following evening, Sunday, Feb. 28. The Honi-Honi Bar, located next to Deep Creek Uno’s Restaurant, will be hosting DunkFest! on Friday, Feb. 26, from 6 to 10 p.m. to kick off the 12th annual Deep Creek Dunk, a fundraiser event for Special Olympics Maryland. This event will feature carnival games, a bonfire on the Honi-Honi lawn, and live music by Remedy Lite from 8 to 11 p.m. All proceeds from the event will benefit Special Olympics Maryland. Special Olympics Maryland provides year-round sports training and athletic competition in a variety of Olympic-type sports for persons 8 years of age and older with intellectual disabilities. The athletes are given continuing opportunities to develop physical fitness, demonstrate courage, experience joy, and participate in a sharing of gifts, skills, and friendship with their families, other Special Olympics athletes, and the community. 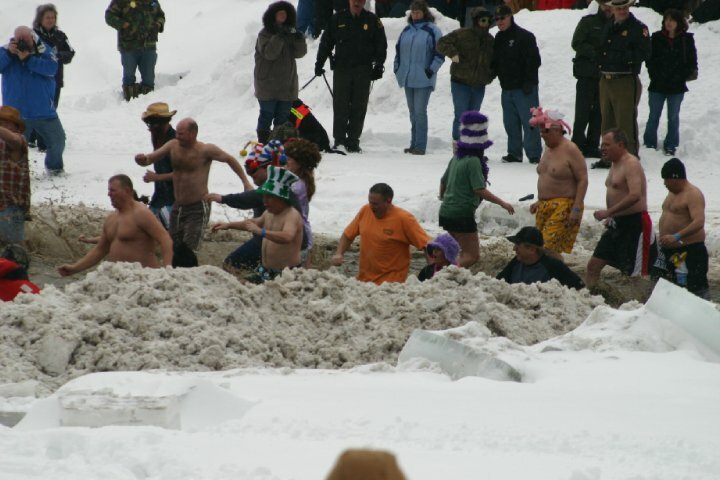 OAKLAND — It’s that time of year again — when a group of brave men, women and children leap into a frigid Garrett County lake, all in the name of philanthropy. 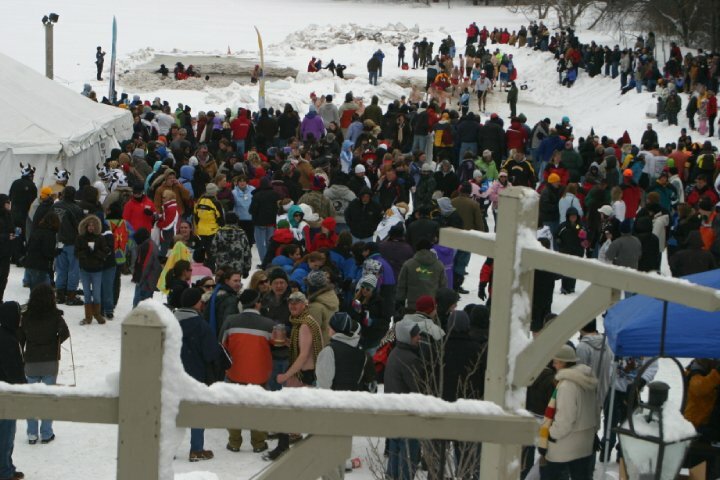 The 12th annual Deep Creek Dunk will be held on Feb. 27 at 2 p.m. behind the Uno Chicago Grill at Deep Creek Lake. Dunkers pay a minimum donation of $50 for the dubious privilege of jumping into the lake in February, but it’s all for a good cause — the money goes to support the Maryland Special Olympics, explained spokeswoman Kelley Schniedwind. The event kicks off the Maryland Special Olympics Winter Games, which will be held at Wisp Resort from Feb. 28 to March 2. Schniedwind said her organization relies on the fundraising efforts of individual participants to make the dunk a success. “We have great corporate support, but the majority of the funding that comes in is from people saying ‘I’m going to go to my neighbors, my friends, my family, and ask them to support me and this cause,’” she said. Schniedwind said the Maryland chapter of the Special Olympics began holding fundraising dunks in Annapolis, and when that proved successful, decided to hold another in Western Maryland. Last year’s Deep Creek Dunk raised about $160,000, Schniedwind said. The official dunker turnout was 799, with an additional 1,000 or more spectators coming out to watch from dry land. The dunk has become an all-day event, complete with lunch for dunkers courtesy of the Uno Chicago Grill and an after-dunk party at Black Bear Tavern. For prospective dunkers, it’s never too late to register to participate, either online at www.dunkmd.com, or in person on dunk day, starting at noon. Kids can participate too, but dunkers under 18 have to have a consent form signed by a parent or guardian. For further information, contact Special Olympics Maryland at plunge@somd.org or call (410) 789-6677.